At last the road to Calvary is trodden, and now it lies behind Jesus, who has gone up the mountainside for the last time, and been stripped of his garments and lifted up on the cross. Now from the cross, before his eyes are darkened, he can look back down that road which is indeed an image of the road through life of all those who will come after him. On that road he has known those things which every Christian, everyone who follows him, must know too on the journey between birth and death. He has known pain, exhaustion, apparent failure, shame. But it has not only been tragedy. He has known, too, the blessed dependence of a man upon other men; he has been helped by them and accepted their help; he has realized the joy and the light that comes to other men through helping him – above all through helping him to carry his cross. He has known compassion from the women he met on the way, compassion and the heroism that it inspires; the women who blessed him openly with loud voices, and Veronica who dared the mockery of the crowd and the authority of the armed guard to come close to him and wipe the tears and the filth from his face. On that road, too, he has seen the absolute triumph of his mother’s love and trust for him and for his Heavenly Father. She has not doubted him; against all human reason she has believed in him. On that road where so much was dereliction and shame, her fiat: “Be it done to me according to thy word,” has flowered with unimaginable splendor. His passion is her passion. She has followed him all the way, and by her side the beloved disciple John, the boy who is to take the place of Christ as her son. And, immensely comforting to him, Mary Magdalen, the notorious sinner who dared the censoriousness of the Pharisees, has now dared the mob surging about him on the Via Crucis and followed him to Calvary. With her, other loyal, heroic women, who are with him now beside the cross: “His mother and his mother’s sister, Mary the wife of Cleophas, and Mary Magdalen, had taken their stand beside the cross of Jesus. And Jesus, seeing his mother there, and the disciple, too, whom he loved, standing by, said to his mother, ‘Woman, this is thy son.’ Then he said to the disciple, ‘This is thy mother.’ And from that hour the disciple took her into his own keeping,” (John 19:25-27). To his enemies this seems to be the hour of their triumph and Christ’s defeat, but in fact it is the supreme hour of his triumph. Now when he seems to be more helpless than he has ever been before, he is in fact more powerful. When he seems to be more limited, more restricted, his love is boundless, his reach across the world to the hearts of men in all ages is infinite. But to those who look on, how different what appears to be happening seems to what is really happening. How certain it seems that Christ has been overcome, that his plan of love for the world has failed utterly, that he himself is a failure, his “kingdom” a pitiful delusion. Can this be the same Christ who only three short years ago went up into another mountain and spoke to the multitudes, filling the heart of each individually with secret joy and hope? – teaching the poor their own glory, revealing the secret of his personal beatitude to each one who suffered, to each who was downtrodden or unjustly treated, showing them each the reality of the poetry of life, the inwardness of the kingdom which was already theirs if they could receive it with simplicity and the values of unspoilt children? Did he not tell them, and did they not believe, that their very poverty clothed them, not in drab, worn garments, but in those that, seen by the true vision, are richer than Solomon’s robes, lovelier than the iridescent lilies growing in the fields of Palestine? Did he not convince them that if their hearts were pure, the Kingdom of Heaven was already theirs – and he himself, who strewed the wild flowers under their feet and gave them the morning star, their king? But now on this other mountainside how different everything seems to be. What hope is there now for them? Their king is poorer than any of them. 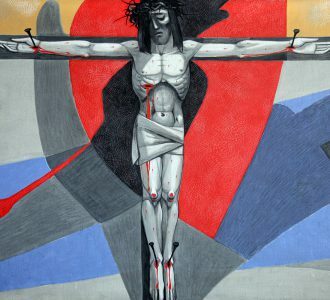 He is stripped of all that he has; his crown is a ridiculous crown of thorns; he has nothing left of his own, not even a grave to receive his dead body. Far from being clothed in splendor that rivals the glory of Solomon, or beauty that rivals the wild flowers, his own natural beauty is hidden under wounds and bruises. He has never seemed so helpless as he seems now, not even as a little infant in Bethlehem. The hands that could raise the dead to life with a touch, could heal the sick and give sight to the blind, are nailed to the hard wood: unforgettable, stiffening in death. The feet that blessed the delicate grass by their touch, that walked on the swiftly moving waves of the storm at sea, are fastened down to the rough trunk and held still. The eyes that could see into the depths of the soul are darkening with the blindness of death. The tongue that spoke the words of eternal love is swollen with thirst, and stiffened in death. The heart of the man who is love is turning to a small, hard stone that a man could hold in his hand! He seemed to be quite alone, quite defeated, dying a useless death at the end of a useless life, the tragic life of a poor deluded dreamer who, because of his fondest delusion that his love for the world could save it, had come to a still more tragic death, to die alone, an object only of scorn or pity – not even hated now, since now he is powerless – beaten. Men hate only when they fear. But Christ would not come down from the cross – “I, if I be lifted up,” he said, “will draw all men to me.” Now he had done just that, he had drawn all men to him because he was dying all of their deaths for them; he was giving himself to them in death, so that in their turn they would die his death, with his courage, his love, his power to redeem. From that moment when he bowed his head, crying out: “Father, into thy hands I commend my spirit,” and died, everyone indwelt by him to the end of time would die his death, with his power to heal and strengthen and redeem themselves and other men by their dying. He came to the tremendous mystery of his death alone, he felt forsaken even by God; but from that moment until the end of time, no Christian man or woman or child will die alone. Each one will die Christ’s death, their hands in his hands, their feet folded upon his feet, the last beat of their hearts the beat of his heart; and because he has made their deaths his own, theirs too will have the power of his to save themselves and those whom they love. There are people who are haunted all through their lives by the fear of death, and when it comes close – when it is no longer something far away which they cannot even imagine happening to themselves – it is a hard thing to accept, let alone to welcome or want. Most of us are too weak, too sinful and too much unaware of the other world to long for God as some of the saints do. We are far too rooted in Earthly things, too dependent for the flicker of courage that we have upon creatures and creature comforts. We do not, we cannot, realize that we are going into the light and warmth, that in God we shall find again everyone and everything that we loved here – and more than that, because the most lovable of his creatures is only the very dimmest reflection of himself. We not only cannot realize the light and warmth that we are going to, but we feel ourselves slipping into silence and darkness. We want to cling to people, to hear their voices, to see their familiar faces, to feel the comforting touch of their hands. We want to cling forever to the here and now that we know, and suddenly the here and now is slipping away from us, and we can no longer hold on to it. After all it seems, now that death is near, that we do not know God the Father at all. Of course, long ago we made countless acts of love, but really we are too Earthly, too limited; we just have not got the capacity to love and trust ourselves to God who, as we learnt in our childhood, “is the Supreme Spirit who alone exists of himself and is infinite in all perfection”: God, whom we cannot visualize, cannot touch, cannot imagine, cannot know with our senses or with our tiny minds; God whom we could not love but for one thing, one supreme mercy, this: that Christ has given us his own heart to love him with, his own mind to know him with, his own will to surrender ourselves to him with and with which to put those whom we love into his hands, his hands of infinite mercy. That is why Christ would not, could not, come down from the cross. On the cross he carried us all through the darkness of death to the light, through the chill of death to the warmth, through the fear of death to the love of God. It is with his heart that we love the Father in the hour of death, because he has given his heart. He has given us our Heaven. We are not alone in the hour of death; we have nothing to fear in the hour of death: because when the time comes Christ identifies himself with us so closely that fear gives way to trust and anguish to peace. He has lived all of our lives, died all of our deaths; to all of us he has given his peace. It is in the hour of death that our fear, our anxiety, our loneliness will end and we shall understand Christ’s words: “Peace is my bequest to you, and the peace which I give you is mine to give; I do not give peace as the world gives it. Do not let your heart be distressed, or play the coward,” (John 14:27). As Christ died on the cross he drew all those to himself who would die his death and enter with him into the mysterious glory of it, all those who by dying would redeem other men: those whose lives seem to be failures, to be cut off before they have come to their flowering; those people who could have had brilliant careers, who could have benefited their fellow men immeasurably, but are cut off at the very beginning of manhood, or who die in childhood; deaths that seem to be nothing else but waste to which we cannot reconcile our hearts. He identifies himself with all the young men who would die in battle, all the men and women who would fall in the squander of destruction that is war, all those children who would die in innocence with the burning splendor of his purity still radiant in their souls, with his passion of love still whole and not frittered away. He identifies himself with the old people who, when death comes, will think their lives were wasted, who will think that they have done nothing for God’s glory, taken no part in the world’s redemption, but who in reality are dying his death and saving the world in the power of his love. Christ on the cross is God and man, he is wholly human; he knows the utter desolation and loneliness of death as no other man will ever know it. He knows the grief of leaving those whom he loves – his mother, his friends, Mary Magdalen who seems utterly dependent on him. He feels abandoned by his Father. He is dying all our deaths. Death is too big a thing for any one of us to face alone. It separates us, for a time, from those we love on Earth. It is difficult for us Earthbound, rooted creatures to want Heaven; it is impossible for us to realize what the glory of God will be to us. It is loving God, and that only, that can make Heaven, Heaven. Here imagination does not help us: we cannot really imagine ourselves loving the “Supreme Spirit” – we even want to cling to our human frailties and comforts, to our human weakness. It is now that Christ takes over. He has died all our deaths on the cross; now we are going to die his; it is Christ in us who surrenders to God. It is not with our own heart and our own will that we can long for God, but with Christ’s. And Christ has given his heart and will to us. In this is the supreme mercy that comes to us in the hour of death. Now I love God with Christ’s will, with Christ’s heart, with Christ’s trust; and because he has taken whole possession of me, in the hour of my death I shall at last love my friends too with his love. Not only will my suffering of mind and body, molten into his in the fire of his love, be the beginning of my blessed purgatory purifying me; it will also be Christ’s sacrifice on the cross offered for those whom I love. my heart and my mind and my will. I commend those whom I love. I agree. I find Miss Houselander’s approach to the stations to be most unique.